Exxon Mobil Corporation (XOM) engages in the exploration and production of crude oil and natural gas, and manufacture of petroleum products, as well as transportation and sale of crude oil, natural gas, and petroleum products. 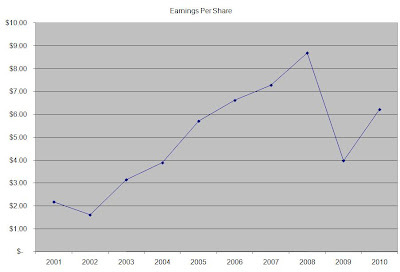 Exxon Mobil is a component of the Dow Jones Industrials and the dividend aristocrats indexes. Exxon Mobil has paid uninterrupted dividends on its common stock since 1882 and increased payments to common shareholders every year for 28 years. 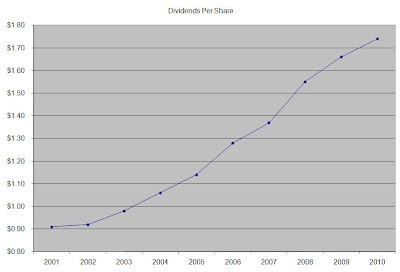 The most recent dividend increase was in April 2011, when the Board of Directors approved a 6.80% increase to 47 cents/share. The major competitors of Exxon Mobil include Chevron Corp (CVX), British Petroleum (BP) and Royal Dutch Shell (RDS-B). The company has a strong reserve replacement ratio, which ensures it would not run out of oil. The sheer scale of the company gives it huge economies of scale. Its productivity is further boosted by the efficiency of developing new projects in Quatar, Norway and US. Exxon Mobil does business on over 200 countries and derives only 30% of its revenues from the US. The company has over 130 projects worldwide whose goal is to increase reserves of oil and natural gas. The company’s future acquisition of XTO Energy will boost natural gas production by over a quarter. XTO’s resources are close to the markets it serves. In addition to that technical expertise from XTO energy could assist Exxon Mobil in developing new shale fields worldwide. Exxon has been accumulating natural gas assets, which could provide the company with long term dividends given the low prices of natural gas. 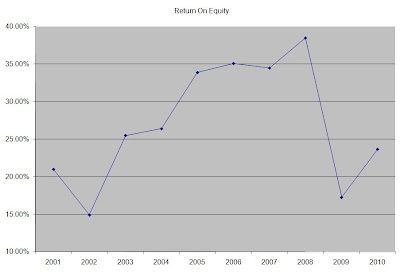 Currently Exxon Mobil is trading at 11.50 times earnings, yields 2.30% and has a sustainable dividend payout. 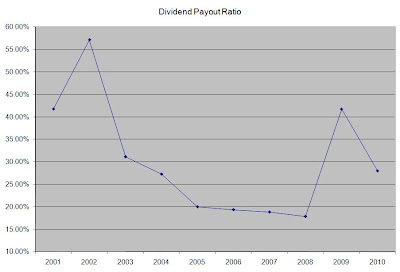 Despite rising oil prices, and the low P/E ratio, the company has a very stingy dividend payout in comparison to its peers. As a result, I would only consider adding to my position in the stock on dips below $75.